Adjacent to the Harbor Point property is the former Monarch Chemical property which is being addressed by another party under a separate cleanup order. Currently, a gas regulator station, electric substation and National Grid’s remediation research facilities occupy Harbor Point. The remainder of the site is largely undeveloped land. The nearest residential area is a multi-family public housing complex located across the railroad tracks, about 500 feet beyond the southern-most site boundary. NATIONAL GRID PROPERTY: On the 72 acre National Grid parcel, gas was manufactured from coal from approximately 1848 to the early 1950s. Gas was produced utilizing both the coal carbonization process (Coal Gas Plant) and the water gas process (Water Gas Plant). Wastes generated from the gas production were often used as raw materials by other chemical processors, also located on the peninsula. This site is the largest property on the peninsula and since 1950 has been owned by National Grid, with the exception of a fringe area along the water bodies owned by the New York State Canal Corporation. 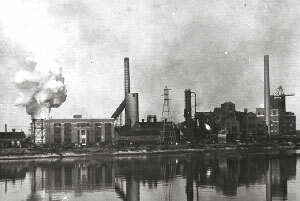 Prior to 1950, the Utica Gas and Electric Company owned and operated the site. 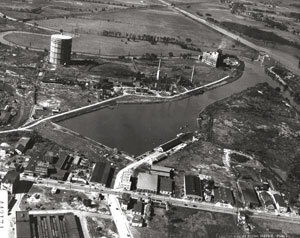 MOHAWK VALLEY OIL (MVO): From 1926 to 1951, a plant located on the east side of this site refined the light oils generated during the Harbor Point gas production into gasoline and toluene. Tanks containing Number 6 fuel oil were also present at the light oil plant. Located in the middle of the MVO site, during approximately the same time period, the Rosselli Tar Asphalt Services reportedly received tar from the NYTEP facility. Petroleum bulk storage terminal operations existed at the western end of the Mohawk Valley Oil Site. Texaco, and/or other companies stored gasoline, Number 2 fuel oil and other fuels here. All MVO site storage tanks were removed by the mid-1980s. This site is comprised of three parcels: the former Niagara Flats Terminal, the former Rosselli Associates Tar Asphalt Services and the former Texaco Terminal. NEW YORK TAR EMULSION PRODUCTS SITE (NYTEP): Starting in 1926, the American Tar Products Company and later the Koppers Company used raw coal tar obtained from the Harbor Point gas production to produce road tars at this location. 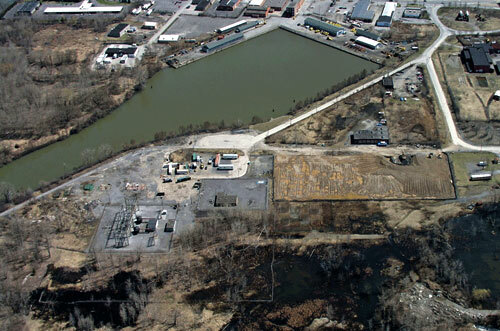 After 1955 raw coal tar was delivered to the NYTEP site from other locations, by barge via the Utica Harbor. Operations at NYTEP ceased in 1983. Waste disposal is believed to have occurred at these sites as part of the typical industrial operations which required the wastes to be removed from the system. In addition, contaminants were also likely released to the environment through breaks or leaks in plant containment structures or piping. Two major types of waste materials are present on the peninsula: coal tars and purifier waste. Coal tars are reddish brown, oily liquids which do not readily dissolve in water. Materials such as this are commonly referred to as a non-aqueous phase liquid, or NAPL. Although most tars are slightly more dense than water, the difference in density is slight. Consequently, they can either float or sink when in contact with water. Tars were disposed, or spilled or leaked from tanks, gas holders, and other structures at several locations throughout the peninsula, and have moved laterally away from these locations through the subsurface. Near the ground surface, some of the tars have weathered and partially solidified. In these areas tar is found in thin crusts on the ground surface, and fresh seeps of tar can be seen breaking through the crust when the weather is warm enough to allow the tar to liquefy. Elsewhere, the tars retain their original, oily fluid properties and may still be capable of moving slowly through the subsurface.